Kokikai Aikido, founded by Shuji Maruyama Sensei, is a realistic, logical martial art based on the principle “Minimum effort, Maximum effect”. This philosophy is given life through the old adage, quality over quantity. Kokikai Aikido concentrates on logical techniques, with the recognition that the person doing them must be at their strongest for them to be most effective. 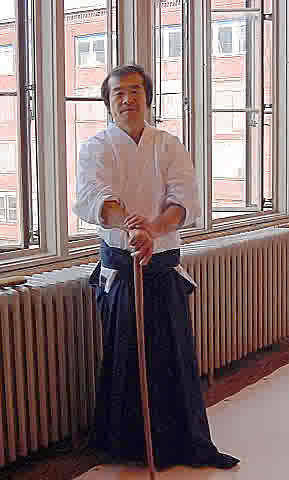 Kokikai strives to produce strong people/technique through what we call the “correct feeling”, as opposed to many different techniques lacking any power. This “correct feeling” is achieved through practice of “The four principles”. These principles are the map every Kokikai student uses to find this “correct feeling”. Through practice of the four principles a more confident feeling in our practice and in daily life is achieved: producing a more well rounded person. Kokikai uses a series of tests used to find this “correct feeling”. These tests, called “Ki tests”, check the mental and physical postures for stability. This stability once found can be defined as our most natural or strongest state. We call this our “correct feeling”. This correct feeling is then applied to daily life as well as in our technique, making us stronger in both daily activities as well as in Aikido. Through finding a more correct mental and physical posture we can begin to find more happiness in our daily activities in and outside Aikido. Anyone can find their strongest state. – The official web site of Kokikai Aikido. This site, hosted by Kokikai of Maryland, has a wealth of information, including a more comprehensive description of Kokikai Aikido, feature articles, a dojo directory, and more! Aikido Today Magazine – Articles and more. Aikiweb – A repository for aikido information.